Editor’s Note: The following text and images are taken from the autumn 1986 edition of Issue 21 of the Hertfordshire’s Past magazine. The article, written by John Brushe has been reproduced as it was in the original booklet after the author, an archaeological historian, gave permission for the article to be reproduced online. You will notice that North Mymms is spelt North Mimms. The image above this introduction is the cover for the original piece. Website editor, January 2018. 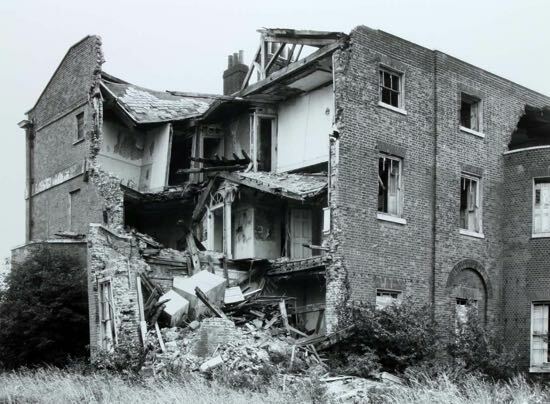 In 1973 the exhibition at the Victoria and Albert Museum entitled ‘The Destruction of the English Country House’ roused a good deal of public interest and comment. 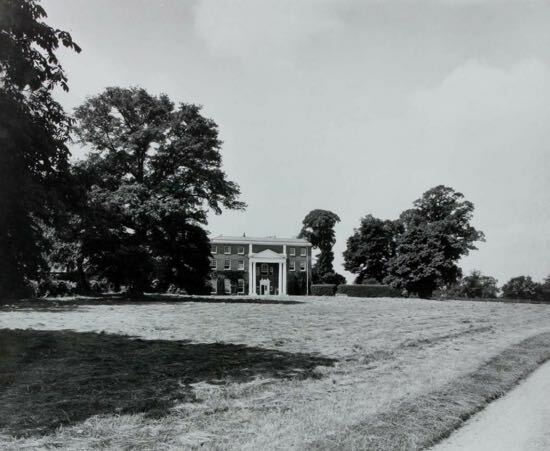 Its theme is of particular interest to North Mimms, a parish chiefly characterised by an unusual number of country houses: North Mimms Park survives; Gobions and Brookmans are gone; Potterells is going, a country house in the last stages of decay. The origins of Potterells are obscure. It emerged around the fifteenth century as a sub-manor of Brookmans and continued to be attached to Brookmans until 1632 when the reversion was sold to Thomas Coningsby of North Mimms Park. The Conningsbys sold North Mimms Park in 1658, when Potterells became their family seat. The house remained in the family until 1753 when it was left to two cousins - Charles Delaet and Catherine Dell - jointly, with remainder to Charles Delaet who became the sole owner on the death of Catherine Dell in 1769. Charles Delaet died in June 1792 without issue, leaving his property in Hertfordshire and Middlesex to his friend Justinian Casamajor, of High Canons in the neighbouring parish of Shenley, and his third son William Charles Casamajor (godson of Charles Delaet), and their heirs male. In the unlikely event of a failure to produce an heir, the property was to go to distant cousins of Delaet, the Sibthorps of Canwick in Lincolnshire. It is Justinian Casamajor who was responsible for the house as we know it today. The Casamajors, as one might guess from their name, were a family of Spanish origin, claiming descent from the royal house of Castile and Leon. In 1695 Don Luiz John Casamajor, a merchant of Cadiz, settled in Bristol and founded the English branches of the family. Was it perhaps the sherry wine trade which brought him here, a business of course with which Bristol is still associated? The family prospered: by the late eighteenth century there were Casamajors in London, who had made their fortune working for the East India Company; and Casamajors, merchants of Tockington in Gloucestershire, which is not far from Bristol. Justinian Casamajor however was brought up a gentleman, and lived off income. His will mentions interests in Antigua and St Kitts in the West Indies, and he had shares in a warehouse in Bristol. Like William Beckford, the caliph of Fonthill, Justinian Casamajor’s wealth came from sugar-cane plantations. Justinian Casamajor clearly had social ambitions, for when he inherited Potterells he sold High Canons and set about rebuilding the house on a grand scale. With the mansion went a small estate of some 200 acres, and like other much greater landowners of his time Casamajor went in for agricultural improvements. Arthur Young, who had farmed (unsuccessfully) at North Mimms and thus knew Casamajor well, mentions him several times in his General View of the Agriculture of Hertfordshire published in 1804, praising his model farm, his barns, his South Down sheep and his bailiff Roberts - ‘a sensible, keen, able man of great experience’. In the chapter ‘Of Livestock’ there is a delightful dialogue, modelled on Varro De Agricultura, between Mr Casamajor and Roberts on the respective merits of horses and oxen as working animals: Mr Casamajor favoured oxen, his bailiff horses, but they differed amicably. Casamajor had a team of ten oxen and four carthorses. Justinian Casamajor’s social ambitions were achieved in 1800 when he became High Sheriff of Hertfordshire. The previous year his eldest son had been appointed secretary to our Ambassador to the Court of St Petersburg. The Casamajors appeared to ‘arrived’. Justinian Casamajor died at the age of 73 in 1820, at Rawleigh House in the parish of Pilton near Barnstaple in Devon, where he had presumably removed for the sake of his health. The rebuilding of Potterells then was part of the Casamajors’ bid to join the county elite. 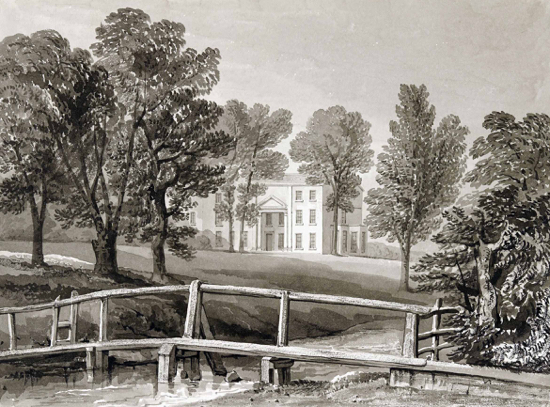 William Oldfield’s drawing of about 1800 (fig.1) shows a magnificent late eighteenth century house. On the facing page of the album (one of several in which Oldfield’s drawings are bound) now in the Hertfordshire Records Office is the note: ‘Potterells the seat of Justinian Casamajor Esq. in North Mimms, the present owner who has added to the house and embellished that which was before standing’. This suggests that Casamajor only remodelled an existing structure. In fact, Oldfield’s view is not quite accurate. As we see from Buckler’s view of 1840 (fig.2) there were only two bays to the right of the portico, not three - a lack of symmetry which betrays an older core. This is confirmed by looking at the plan (fig.3). Notice first the orientation. The house faces east-west. Now by the late eighteenth century it was usual to build new houses to face south with the entrance front at the north. At Potterells it is the service end of the house which enjoys the southern aspect. This suggests a house of not later than the mid-seventeenth century, for until then the belief was current, which we might find rather surprising, that the south winds were unhealthy and that a house should ideally face east. Andrew Boorde, writing in 1562, recommends a man to ‘ordre and edify the howse so that princypall and chyefe prospects maye be Easte and West, especially Northeast, South-Easte and Southwest, for the meridial wynde of all wyndes is the most worste, for the South wynde doth corrupt and doth make evyl vapours. The East wind is temperate, fryshe and fragrant. The West wynde is mutable. The North wynde purgeth evyle Vapoours, wherefore better is of the two worst that ye windows do open playne north than playne south’. What we have at Potterells, I believe, is the early seventeenth century Coningsby house which Casamajor transformed by filling in the space between the projecting wings of a typical half-H plan house with his new portico, adding an elegant bow to the garden front, recasing the old house in new brick, removing its gabled roof and adding a new attic storey and bay windows to the north. Some of this may have already been done by Charles Delaet. One might assume that the great pillars framing the entrance were of stone; in fact they were of wood, painted white. Only their bases were of Portland stone. This is not the only place in the house where wood and plaster substitute for stone and marble. It was like a beautiful stage set. Casamajor’s architect is unknown, but the importance of wood in the remodelling suggests an architect trained as a carpenter or joiner, which was not unusual at the time. He worked in a conventional late eighteenth century manner. The composition of the garden front (fig.4), a bow flanked by blind arches framing garden doors, is close to James Adam’s Fore Street elevation to the Shire Hall at Hertford. Above the bow is a semi-circular thermal or Diocletian window. The portico is a bold stroke and the planning is not without its ingenuity. The rectangular main block incorporates a service block whose upper floors are independent of the rest of the house and unconnected except on the ground floor. The kitchen itself was housed in a detached service wing. The house as it stands today presents a very different sight and a very sad one. The great portico has collapsed and a column split to show it was hollow and made up of moulded planks. The north-west corner of the house has collapsed, no doubt weakened by the addition of the bay window which, as the plan shows, is very close to the corner. The stable block has been rebuilt as a rather ugly small modern house, but incorporating the turret of the original stable clock with its face dated 1767. This probably records the construction date of the whole block. Something may well have been done to the house at the same time. Justinian Casamajor probably completed the rebuilding of Potterells in 1799, for there is a brick bearing this date incorporated in the detached building - the former laundry - at the far end of the garden front, not shown in the plan, where the work is likely to have ended. 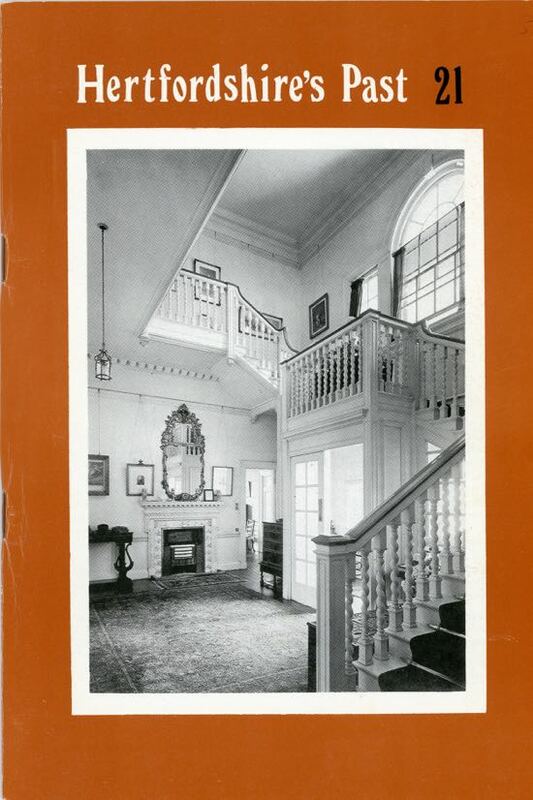 Fortunately the house is recorded in a set of fine photographs taken by the firm of Bedford Lemere in 1933. They are in the possession of Lady Stourton, who was brought up at Potterells and is a member of the last family to live there, the Seymours. The view of the entrance front (fig.5) shows a central doorcase in the Queen Ann style and a Venetian window above. These date from 1908 when the house was again remodelled. 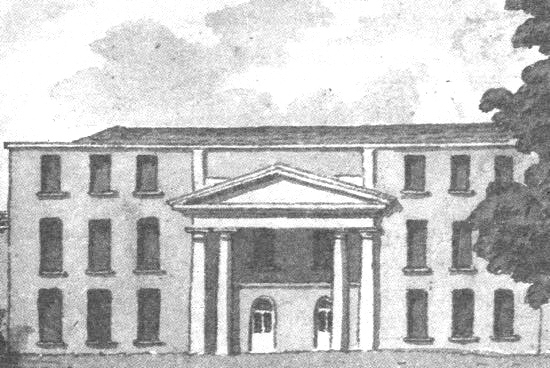 Originally the portico sheltered two doors, as we can see in Oldfield’s drawing. The garden front (fig.6) enjoyed a superb view out towards North Mimms Park and the parish church. 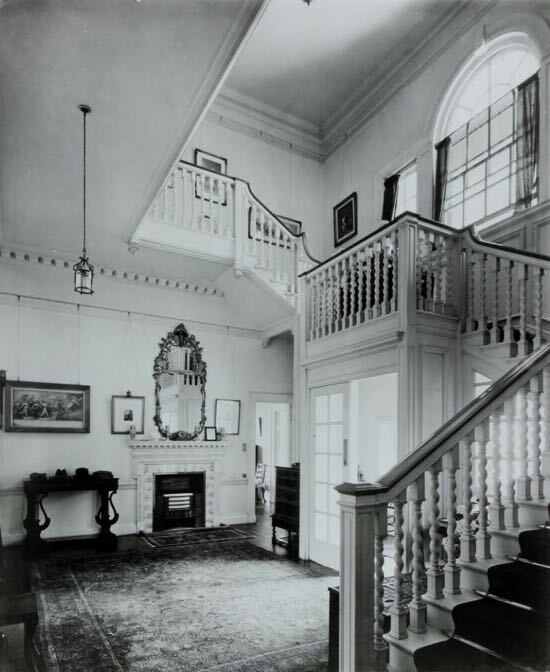 The hall was created in 1908 when two rooms were probably knocked into one to make a grand staircase hall (fig.11). In the process of decay plaster has fallen away from the back wall revealing timber-framing which may date back to the seventeenth century house, including a doorway blocked by the wall which later divided the library from the passage to the garden. The room to the north of the hall, with two shallow niches on the inner wall, one framing the door to the hall, may originally have been the state bedroom: it was still usual in the late eighteenth century to have a state bedchamber on the ground floor. Latterly it served as a billiard room. 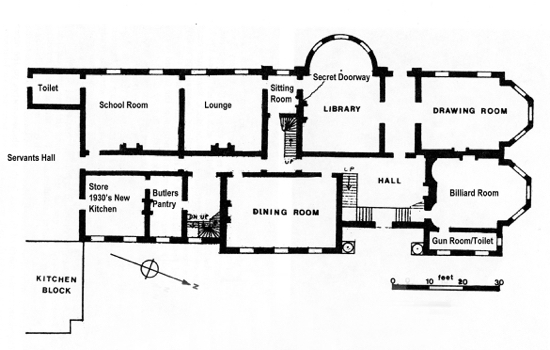 North of the garden passage lay the drawing room (fig.7). This was beautifully detailed right down to the shutters and window reveals. It had ornamental plasterwork and a fine marble chimneypiece. Grand double doors led through the passage communicating with the hall and the garden to the library, which had fitted bookcases on three sides. A concealed door, hidden by the leather spines of false books, led to the rest of the rooms along the garden front. The room above the library was known in Casamajor’s time as the Bow Room. 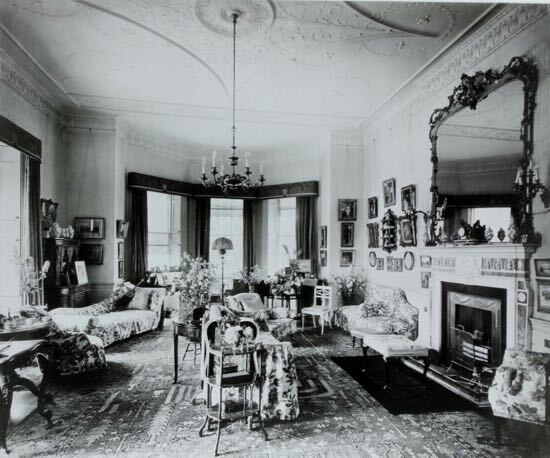 In his will he left the contents of this room - the organ, harpsicord, piano-forte, music, pearls, shells, fossils, coins, corals, pictures, prints, cabinets, writing desks and beds to his daughters Emma, Henrietta and Caroline. They also received the books from High Canons and ‘the globes left to me by the late General Harvey’, which it ought to be possible to trace. 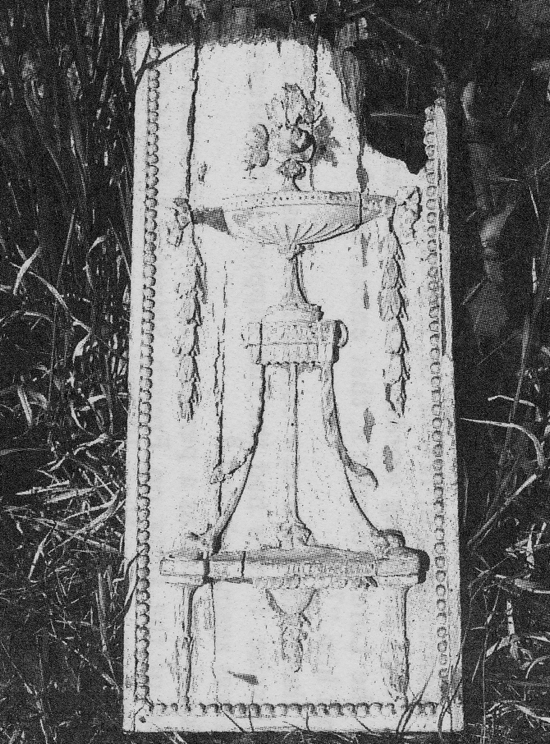 Justinian Casamajor is buried in Pilton where he died in 1820. There is something odd about his will. No estate duty was paid, and across the accounts is written ‘Insolvent’, and a mention of a letter from the West Indies. Casamajor’s money came from his sugar plantations in Antigua and St Kitts. After the victory of Waterloo in 1815 and the lifting of Napoleon’s continental blockade gave access to European produce again, the sugar market collapsed. William Beckford was obliged to sell Fonthill and retire to Bath. It may be that when Casamajor’s financial affairs were examined his heirs found there was no money in the bank to pay for his legacies, and so no estate duty. It would be fascinating to know the exact story. Potterells did however remain in the family, although let to Sir William Pepys, bart, at least until 1834. Casamajor’s eldest son Justinian - who was not due to inherit Potterells - died unmarried in 1821. A younger brother, Louis Duncan Casamajor, who was also in the diplomatic service, had died in St Petersburg in 1820. 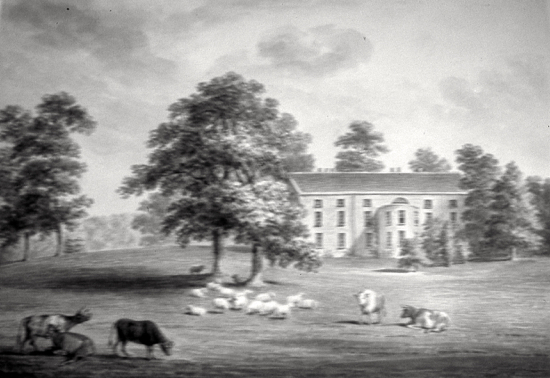 Henrietta Casamajor appears to have remained at Rawleigh House in Devon, where she died in 1824. By 1839 the occupier of Potterells was William Charles Casamajor, the godson of Charles Delaet. He lived there until his death in 1847, unmarried, at the age of sixty-seven. Also living at Potterells in the 1840s were James Archibald Casamajor and his daughters Jane and Elizabeth. James was head of the elder branch of the Casamajor family. A wealthy nabob, he may well have helped William Charles to resume occupation of Potterells. James’s daughters and co-heiresses both made good marriages - Jane to the Earl of Enniskillen and Elizabeth to Robert Gaussen of Brookman’s Park, both marriages taking place at North Mimms church. Justinian Casamajor’s two youngest sons, John and George James, both appear to have gone out to India, where they died unmarried. Thus, the unlikely happened: the property went to Colonel Sibthorp of North Mimms Park and Canwick Hall in Lincolnshire. The last member of the family of Justinian Casamajor, his youngest daughter Caroline Lydia, died a spinster in 1853 at Moffats, aged 65. She left an endowment of £3,000 to the girls’ and infants’ school built by her at Water End. Colonel Sibthorp did not hold on to Potterells for long. He appears to have sold the house to a John Wheen by 1859. In 1870 the house belonged to William Cotton Curtis who remained there until the end of the century. Beatrix Potter, brought up at Camfield Place not far away, mentions in her diary being given tea by Mrs Cotton Curtis, and being very bored. In 1908 the house was bought by Hugh Francis Seymour. 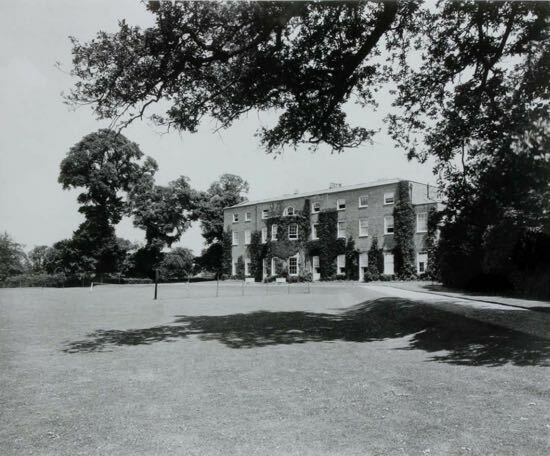 The Seymours remained at Potterells until 1933 when the house was sold. It was not lived in again. The estate was bought by a property developer, Mr. H.P. Small, who hoped to demolish the house and build over the estate, but was prevented from doing so by the Green Belt regulations. The house became a furniture store. During World War II the outbuildings became a small arms factory, which gave way to an engineering firm making precision instruments. The house was sold in 1965 to the owner of the firm but remained unoccupied, becoming derelict and increasingly ruinous. It is an extraordinarily sad experience to see the wreck of this great house (fig.8) and (fig.9), and so much superb craftsmanship decaying beyond recall. A panel from the painted wood chimneypiece of the billiard room, smashed by the fall of the ceiling and destroyed by wet rot, gives some idea of the exquisiteness of the decoration which is being lost (fig.10). 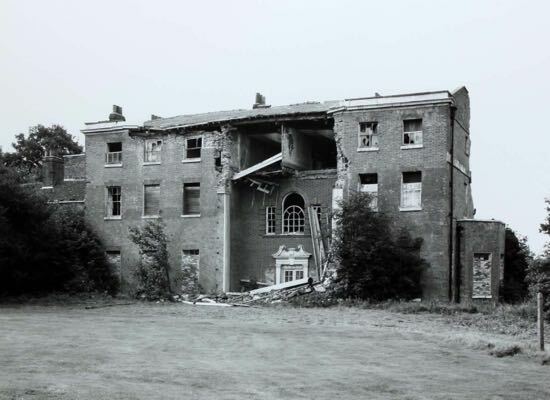 This article is based on a lecture delivered at the Hertfordshire Local History Council’s Second Symposium on Hertfordshire History, 1981, and to the North Mymms Local History Society in 1982. I would like to acknowledge the assistance of Nicolas Dean. Peter Reid, C.C.L. Gaussen Esq., and Lady Stourton (daughter of the last occupier of Potterells), and of members of the Hatfield and District Archaeological Society. I am also grateful to Lady Stourton for permission to reproduce the photographs of Potterells which illustrate this article from copy negatives made by the Royal Commission for Historical Monuments (England). (Unpublished M.A. thesis, Courtauld Institute, University of London), 1982. Cassey’s Directory of Hertfordshire. 1864. Robert Clutterbuck. The History and Antiquities of the County of Hertford, , v.1. 1815. J.E. Cussans. History of Hertfordshire. v.III. 1879-1881. The Descent of the Family Casamayorga or Casamajor from the Royal House of Castile and Leon. . (Privately printed). London, 1871. Gentleman’s Magazine 1770, 1799, 1820. Kelly’s Directories for Hertfordshire 1846-1937. H.G. Oldfield. Hertfordshire Topography Views. v.V, pp.56-7. (Herts. Record Office). Pigot’s Directories for Hertfordshire 1833, 1839. M.T. Varro. De Agricultura. trans. T. Owen. 1800. Arthur Young. A General View of the Agriculture of Hertfordshire. 1804. Parish registers etc. of Pilton, Devon. (Devon Record Office). Wills of Charles Delaet and Justinian Casamajor (Public Record Office). Online editor's note: The document this piece is taken from is embedded below.